The Painting Center will be presenting Paintings and Works on Paper by Brian Brooks and Robert Bunkin in the Main Gallery. Brian Brooks’ acrylic paintings and drawings represent intimate, domestic interiors and landscapes. He is chiefly concerned with sensations of light and space, using a painterly syntax of vibrant color and gesture on a grand scale. These works are constructed on sheets of paper that are glued together to create unified images. They work through a palimpsest of materials, accreted, reworked, and amended. His paintings resonate with human presence, but the figure never appears directly. Space is scooped out of reality, vigorously illusionistic, yet asserting a modernist sense of the surface. Brooks has shown most recently at the Katonah Museum of Art in Contemporary Confrontations, and has been the recipient of the Lila Acheson Wallace Readers Digest/Arts International Residency at the Monet Foundation, Giverny, France. He is on the faculty of Pratt Institute and Parsons School of Design. 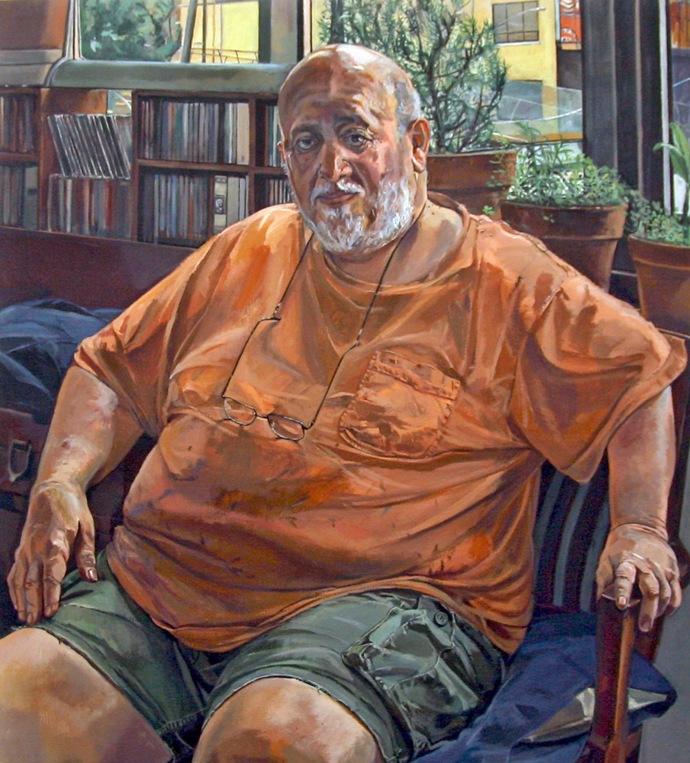 The figure has always been a primary focus of Robert Bunkin’s painting. He has particularly developed the informal portrait, the most recent being the results of pose exchanges with fellow artists. The Contact Series are larger-than-life explorations of intimate contact between an aging couple who has become comfortable in the yielding and mystery of flesh against flesh. The Dryad Series is an outgrowth of the Contact paintings, a kind of reverse “Arcimboldo Effect” whereby tree trunks suggest embedded figures. The sycamore’s variegated bark, convexities and concavities are extracted and monumentalized on the canvas. Bunkin’s most recent solo show was at Long Island University’s Salena Gallery. He has shown extensively in New York, nationally and in Italy, where he lived and studied. He is on the faculty of Parsons School of Design and Borough of Manhattan Community College.